﻿ Nuri Sahin: "Cristiano Ronaldo is not arrogant"
25.11.2011» Nuri Sahin: "Cristiano Ronaldo is not arrogant"
Real Madrid midfielder, Nuri Sahin granted an interview to "Sportbild" on which he assured that Cristiano Ronaldo is not an arrogant person and that José Mourinho has been decisive when he had to choose what club to sign for, in May 2011. Nuri Sahin is finally ready to start assuming his role in Real Madrid, after overcoming a few unfortunate injuries. This last Wednesday, the German-born Turkish player, made his debut as a starter in the club for the UEFA Champions League, against Dinamo Zagreb. In a chat with the German newspaper, "Sportbild", Sahin revealed what he thinks of Cristiano Ronaldo and how important Mourinho has been when the time came to decide which club he was going for, in the last Summer. Being only 23 years-old, Nuri Sahin definately jumped to the spotlight during the last season, after helping Borussia Dortmund winning the Bundesliga and being awarded with "Kicker's Bundesliga Player of the Season 2010-11" trophy. Sahin played a total of 135 games for Borussia's first team, having scored for 13 times and also recorded 29 assists. In Madrid, Sahin has been affected by a series of injuries that have been delaying his appearence on the team's lineup, which happened precisely for the first time this last Wednesday, against Dinamo Zagreb in a UEFA Champions League fixture. 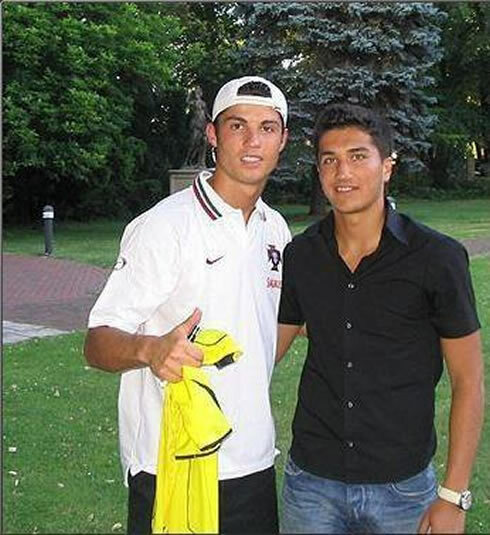 Nuri Sahin: "I have a great relationship with Cristiano Ronaldo. He speaks English perfectly and we're seated almost side by side in the locker room. When Cristiano Ronaldo won the Golden Boot (also known as "Golden Shoe"), he gave a replica to all his teammates in Real Madrid and I think that proves that he is not arrogant at all", referred Sahin, before extending his compliments to a few other players: "We could also say the same about Iker Casillas, Sergio Ramos or Kaká." Regarding his arrival to Madrid, Nuri Sahin confessed his frustration and fears, due to the struggle he had with the injuries he picked. Sahin: "I've never been injured for so long. I don't recall to have been injured for a period longer than 2 weeks. Being forced to be sidelined for almost 6 months has been tough, moreover, I got injured in both knees, which led to me think and question about my possibilities to be able to play again", noted the Turkish midfielder. Nuri Sahin's transfer to Real Madrid was announced back in May 2011, for a transfer fee of 10 million euros. The Turkish player noted that José Mourinho played an important role back then, helping him to decide which club to choose. Sahin: "Mourinho told me he was interested in seeing me playing for his team and he eased my decision. Mourinho is truly a great person, certainly the best coach in the World. He's never happy with someone who can only give 97% of himself...", revealed Nuri Sahin, when asked to comment about his current coach. Nuri Sahin: "I didn't come to Real Madrid for money. Anyone who knows me, is aware that I have my priorities well set. My childhood dream was fulfilled in Borussia Dortmund, just after I won the Bundesliga. The next step would logically be to join the best club in the World", stated Sahin when referring to his choice of joining Real Madrid. Real Madrid next match is against Atletico Madrid, for the Spanish League "La Liga", this Saturday (26-11-2011) in the Santiago Bernabéu. You can watch Juventus live stream, Real Madrid vs Atletico Madrid live this weekend, as well as Getafe vs Barcelona online and also Manchester United vs Newcastle free for the English Premier League, all available from our football live streams. Even though Cristiano Ronaldo missed Real Madrid last match against Dinamo Zagreb, he is not injured and he should be a starter against Atletico Madrid.